Citizens of Tokyo have just elected their first female governor, former defense minister and Liberal Democratic Party member Yuriko Koike. She will preside over Tokyo’s government during the 2020 Summer Olympic Games, to be held in the Japanese capital. “I would like to move forward with a metropolitan administration such as never happened, never been seen, together with all of you,” Koike said on Sunday, when her victory was all but confirmed. The Washington Post reports that Prime Minister Shinzo Abe threw his support behind another LDP member, Hiroya Masuda, governor of the Iwate prefecture and a former minister of internal affairs. Koike ran anyway. And although voter turnout was low—just 27 percent—Koike overwhelmingly bested the competition. A right-wing politician, Koike has previously compared herself to U.S. presidential nominee Hillary Clinton and has openly admired the late, former British prime minister Margaret Thatcher. Tokyo knows her, as do politicians in Washington, D.C. She follows now-former governor Yoichi Masuzoe, whose administration was entangled in scandal. He was forced to step down after misusing public funds — an especially grievous matter as the city readies itself for the Olympics. Ideally, hosting the Olympics will galvanize Tokyo’s economy, and Koike promises to see this task through to a successful end. She also asserts her intention to increase daycare facilities and nursing care for the elderly. With the demographic of working-age citizens dwindling, the government hopes these measures will enable more women to work. 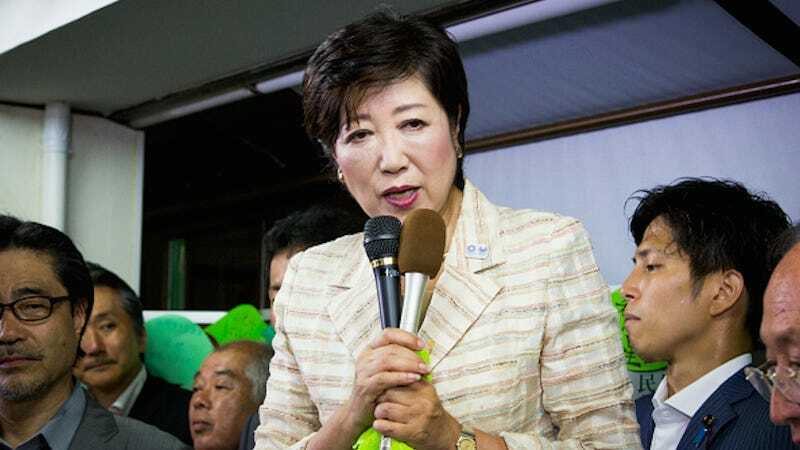 During her campaign, Koike pledged a “fresh start” to the capital city of nearly 14 million people — green, accordingly, was her campaign color. She will serve a four-year term that overlaps with the 2020 Olympic Games.